When a patient's heart stops beating, there is no time for delays and confusion. Hospital are well drilled for this kind of emergency and staff know exactly who should be doing what. But there are claims that a simple design fault could be putting lives at risk. For the last 60 years the design of the resuscitation "crash" trolley, which contains all equipment and drugs needed for cardiopulmonary resuscitation - needed when someone's heart or breathing stops - and for emergency care has not changed. Medics and safety experts agree the situation is less than ideal and warn that the current trolley's layout is confusing and dangerous - and that vital equipment is often missing. Now, after calls from the National Patient Safety Agency (NPSA), a group of designers and doctors, have come up with a new trolley that they believe will help save lives. As well as alerting medics when equipment is out-of-date or missing, the trolley also splits into three sections so that equipment can be used in the order needed and by separate groups working on the patient. Kit is separated depending on whether it is needed to clear an airway, gain intravenous access to give fluids and drugs and defibrillation equipment to restart the heart. Dr James Kinross, from St Mary's Hospital, part of Imperial College Healthcare NHS Trust, who helped with the trolley design, said an overhaul was long overdue. "Remarkably the design is still based on a garage tool trolley," he said. "Doctors and nurses work together under stressful and time critical conditions to resuscitate patients who have suffered a cardio-respiratory arrest. "But data suggests that poor design of crash trolleys may directly influence the risk of an adverse event for the patient, preventing a successful resuscitation attempt. "The design solutions are intuitive and simple so that any member of a team can use the trolley without instruction. "For example, the trolley has no drawers and all medical equipment is highly visible and easy to locate in an emergency." Designer Jonathan West from the Helen Hamlyn Centre, part of the Royal College of Art, and fellow designer Sally Halls, said the new trolley is set to start trials at St Mary's. Mr West said: "The trolleys are basically tall with metal and closed drawers. "The problem with the existing model is that everything is stowed away. "You never seem to have everything you need, which is why we have laid everything out openly. "It is also laid out in a more intuitive way so that you have everything you need first at the top and subsequent things lower down." The design has won two Medical Futures Innovation Awards. 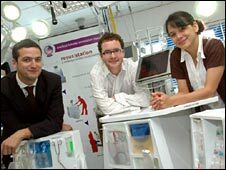 It was also shortlisted for Best National Health Innovation, and the Anaesthesia and Critical Care Innovation Awards. David Cousins, head of safer medication and medical specialties at the NPSA said the new design could make a big difference. "Incidents reported to the NPSA showed that resuscitation trolleys were not always stocked with all the necessary equipment and medicines and sometimes medicines had passed their expiry date. 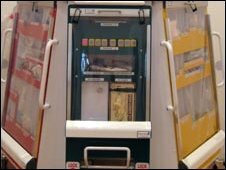 "These incidents demonstrated the need for a re-design of the trolleys in order to help improve patient safety. "We fully support this redesign by the Helen Hamlyn Centre and look forward to seeing the benefits of the trial and roll out."